All-in-one Package PLCs with Condensed Multi-functionality. Complete with a standard-feature USB port, CP1L CPU Units are available for applications with as few as 10 I/O points. Whether you need simple sequence control or pulse I/O and a serial port, the CP1L PLCs give you an economical choice from among 10-, 14-, 20-, 30-, 40-, and 60-point CPU Units. For positioning or communications, simply enter the set values for the instructions. Even complicated functions can be easily programmed using the OMRON Function Block (FB) Library. Attach an LCD Option Board to the CPU Unit to easily monitor or change data values in the PLC to visually check error status. A general-purpose USB cable keeps costs low, including the cable cost. A Wide Range of CPU Units Allows You to Select the Ideal Model. Basic package PLCs with serious functions from simple sequence control to 2-axis positioning control. A Standard USB Port and Two Serial Ports Enable Connecti ons and Communications with a Wide Range of Components. Up to two Option Boards can be mounted for RS-232C or RS-422A/485 communications. A peripheral USB port has been added to connect to a personal computer for a total of three communications ports, making it easy to simultaneously connect to a PT, various components (such as Inverters, Temperature Controllers, and Smart Sensors), Serial PLC Link for linking to other PLCs, and a personal computer. When multiple boilers are being controlled, up to 10 words/Unit of data for settings and monitoring can be exchanged using data links between up to nine CP1H, CP1L, and CJ1M CPU Units. 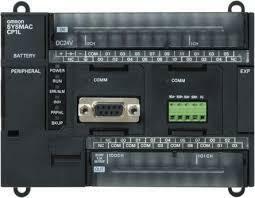 Serial PLC Links can be used with either serial port 1 or serial port 2. Note:Cannot be used for the CP1L-L10. NS-series PTs can also be incorporated as slaves (1:N NT Link connections) to exchange data using the NT Links with only the master CP1H. Each is treated as one slave node. Connecting inverter speed control is made simple using the Modbus-RTU Easy Master. When the address, function, and data for a slave device are preset in a fixed memory area (DM Area), a message can be sent or received simply by turning ON an AR Area bit (A640.00 for port 1 or A641.00 for port 2) in the PLC.